It took many years but the two massive animated franchises finally properly meet. 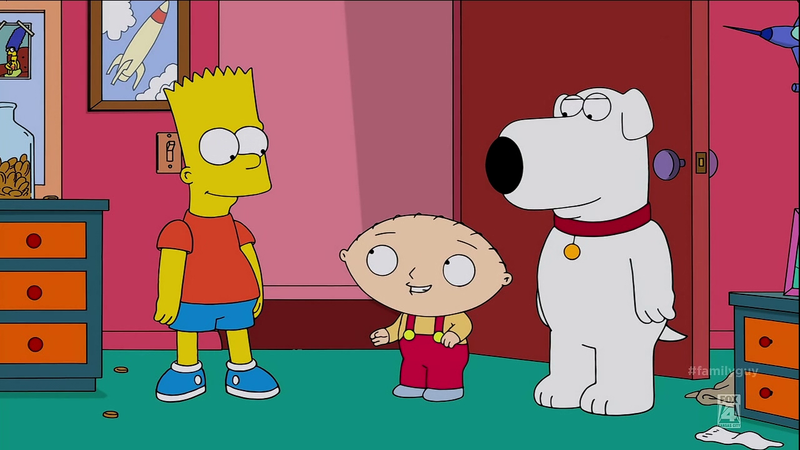 Family Guy and The Simpsons have their first -and likely last- proper crossover. 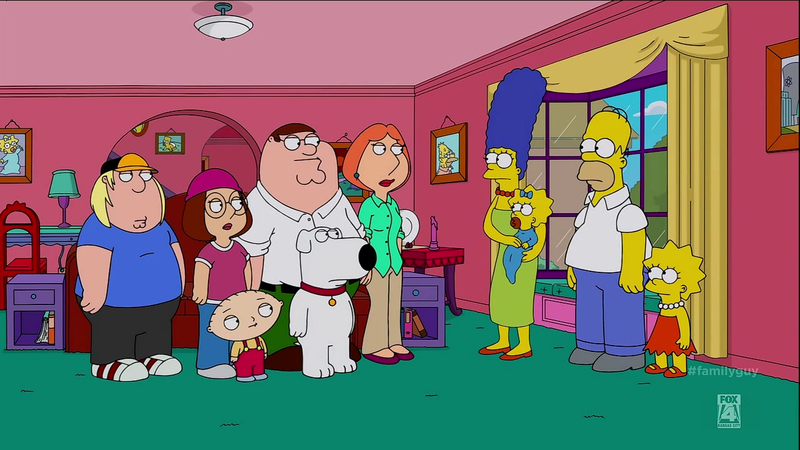 Over the years there have been hints and jokes (Peter appears in The Simpsons as one of Homer’s clones in The Simpsons season 14 episode Treehouse of Horror VIII or Homer’s appearance in the Family Guy season 4 episode PTV among others) but this is the first official bona fide crossover where the characters interact over a long period of time. Make no mistake, this is a Family Guy episode that just so happens to guest star The Simpson family and associated characters. Written by Family Guy writer Patrick Meighan it definitely suits that show in tone and style. This turns out to be no bad thing as the story allows for the visiting characters to be somewhat secondary and much of the plot involves the Griffins being strangers to Springfield so it all works from that perspective. It also feels like Meighan is a fan of The Simpsons when the show was still great and is trying to recapture that old style while paying homage to many of the old jokes like what state Springfield is in or Homer’s fall down the gorge. The results are a mixed bag there but there’s a definite sense that Meighan’s is genuinely trying which is more than I can say for any recent episode of The Simpsons I’ve seen. 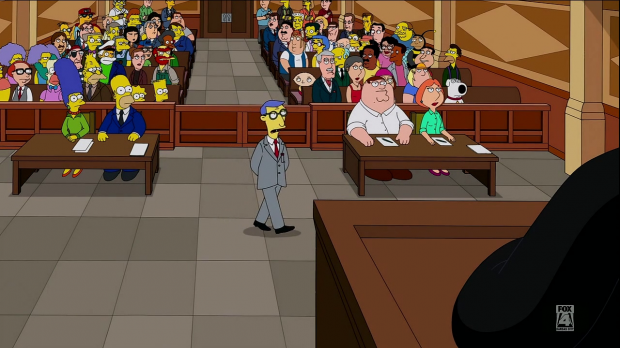 In true Family Guy tradition there are several winks to the audience about what we’re actually seeing like an overt reference to TV crossovers reeking of desperation for both shows or the different skin tones of the animated characters. Every opportunity to compare the two shows and highlight their similarities is taken such as an amusing side by side comparison of characters from both shows or Duff Beer and how similar it is to Pawtucket Patriot ale; the latter acting as a catalyst to directly reference that many people have called Family Guy a ripoff of The Simpsons pretty much since it existed. Peter Griffin and Homer Simpson are absolutely hilarious together. They team up to try and get the Griffin’s stolen car back and neither them have an ounce of intelligence to share with the other so their schemes get stupider and more ridiculous. It’s clear that when left to their own devices they are on the fast track to being killed. I do love what they do together, I can only imagine how much fun it was to write those scenes. I was impressed that Homer felt like Homer given the writer and his lack of experience writing this character. I did enjoy Brian getting stuck with Santa’s Little Helper -who doesn’t talk- and not enjoying being treated like the family pet when he is obviously much more than that. Chris meanders along with this plot but he’s not really needed for it and it’s clear that the writer just didn’t really know what to do with him. Marge and Lois don’t really have any memorable moments together either. Naturally we can’t have them parting on good terms otherwise that would invite other crossovers so there is an event that causes them to hate each other and it results in an overlong, over the top action sequence between Peter and Homer that puts every single chicken fight so far to shame. It’s entertaining and everything but it swallows up so much of the running time of the episode it’s hard to remember what they were actually fighting about. Having Homer and his family in the world of Family Guy does start to feel out of place after a while. The only real attempt at a cutaway gag falls flat because it doesn’t suit The Simpsons to tell jokes in this way. The hyper-real aspects of Family Guy storytelling feel a little odd when Homer is included in them which makes the fight feel a bit strange since The Simpsons has usually been more or less grounded in some kind of reality that resembles our world in the way the physics work, there are exceptions to this but generally The Simpsons plays is straight. That being said it’s still hilarious to see Peter and Homer get up to all sorts of physics defying mischief. As crossovers go this one is mostly a success. Homer and Peter are a force of nature who encourage each other in the worst ways possible which brings out a lot of laughs. 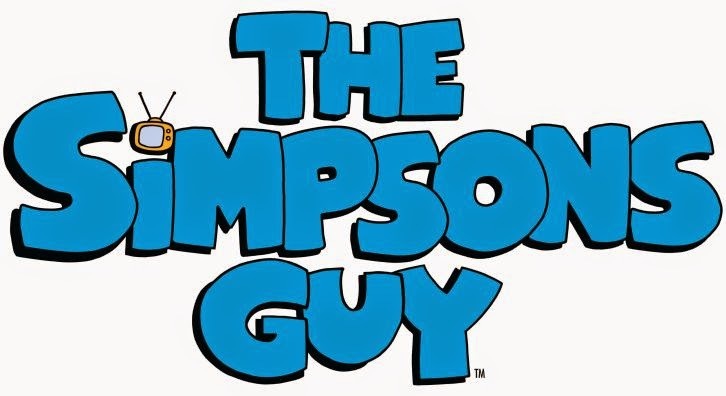 The episode is well written by a veteran Family Guy writer who understands what once made The Simpsons one of the funniest things on television. At times some of the jokes don’t quite work and Homer’s family can feel a little out of place when played against the more unrealistic world rules of the other show. The extended run time of the episode is well used and it feels like no opportunity was wasted as a result. If this is the only crossover we’ll ever get from these franchises then it is assured that it’s a very good one.